The once dominant British loudspeaker industry is not what it used to be. Most of the names are still there; KEF, Celestion, Wharfedale, Mission and Quad are still world-conquering brands, but they are all Far Eastern manufacturers now. If you're looking for what was once a world-beating formula of indigenous originality and sophistication, you're best crossing the channel and heading to companies like Triangle, Cabasse and Focal.JMLab, for the kind of form once that epitomised the best of sophisticated European design and manufacture. Focal.JMlab, based in France, has been conspicuously successful, and the product really is designed, and manufactured, in Focal's own factories. This system tested here is one iteration of the Chorus 800 series, which, like other ranges, is designed on a trickle down principle, using technologies originally designed for the top-of-the-range models (in this case Focal's Utopia Be series). The first thing you'll notice about the Chorus 800 range is the very sharp, distinctive, designer aesthetics. Dressing up rectangular boxes so that the result has some brand identity and originality is an old sport among loudspeaker manufacturers, but Focal engaged a classy designer from Paris, and has delivered the goods. The core technologies are a mix of the familiar (for those with some knowledge with the brand) and one or two new tweaks introduced just for the 800V (and in some cases also the 700V) ranges. What Focal has done is to develop a new enclosure-finish based on an acrylic coating technology which looks similar to piano gloss, and which is applied to the baffle, rear and top panels, but which can be implemented at a much lower cost. The main speakers in the system also feature contrasting wood-effect side panels. Adding an extra touch of distinction to the mix, the front baffle cover has a V shape at the top of the moulding (hence the V in the model names) which helps physically shield the tweeter without covering it, and thereby influencing its sound quality. The aluminium-magnesium alloy tweeter dome is inverted in standard Focal.JMLab form, making them even less susceptible to finger damage. Other highlights include new versions of Focal's cellulose bass/mid driver cones, which are incredibly light, stiffened by a surface treatment of glass 'microballs' front and rear. The resulting sandwich construction is more than usually able to track fast-changing waveforms because they start and stop rapidly. The tweeter mounting plates have also had a makeover to reduce distortion at lower frequencies, and the bass drivers have twin reflex ports, which help at high volume levels by reducing wind velocity through the port tubes. Because one port faces downwards and its output radiates through 360º laterally, it's also less susceptible to positioning changes. 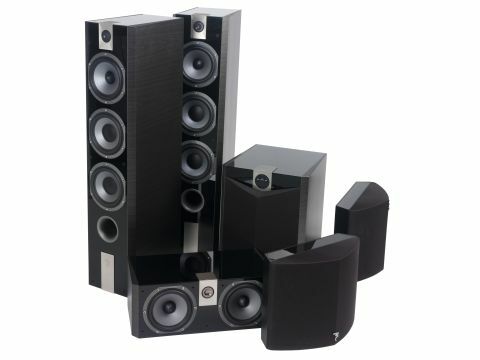 The main speaker is a nominally full-range floorstander, with twin bass drivers. The centre speaker has a conventional twin bass plus flanking a single tweeter configuration. The rears are a bipole design, which gives a very broad dispersion, great for cinema. They are best used attached to the side walls (brackets are supplied) near or just behind the listening plane. This system was conceived as a single unit, and its uniformity of design makes it unusually consistent in operation. The main speakers can be positioned with more freedom than is usual, probably thanks to the port design highlighted earlier. Similarly, the surround speakers focus less sharply, and allow a wider area of good surround sound than more directional direct-radiating designs, especially in smaller rooms. The slight lack of sharp focus is arguably a negative consequence of the usual directivity, but most 5.1 soundtracks generally benefit in practice from a mild degree of defocusing. The subwoofer is fine. Perhaps not the best in class, but I think better than some earlier-generation Focal subs. It performs a little above expectations, probably because the large size of the main speaker means that there is no pressure to use a high crossover frequency, which always has the effect of drawing the ear's attention to the presence of the subwoofer. It has a moderately deep, extended bass, but it sounds more at ease with the crossover setting lower than usually recommended. Around 40-50Hz would be a good starting area, I feel. Overall, I found the system expansive and powerful, with excellent detail resolution thanks to the very fast drive units, and a bass quality that - as long as the settings are not overcooked - sounds like a natural extension of the midband. Dialogue quality is pleasant, unboxy and easy to follow. Also of interest to the music lover is that this system has a natural ease and facility with music. It is not so firmly wedded to the benefits of multichannel replay that it only performs adequately with film soundtracks. I was really rather taken with this Chorus set. In use, the results are expansive and unboxy. The system is relatively unfazed by volume level or seating position. The rears make this a particularly adept movie solution. Sensitivity is high too, so that almost any amplifier will do as long as it auditions well. Power output should not be much of an issue in practice. Well worth auditioning.